He will give his angels charge of you, To guard you in all your ways. One of the FALLEN ANGELS and 72 spirits of SOLOMON . Many small deities of ancient Syria and Persia carry this name, which means “the lord,” but the greatest Baal was an agricultural and fertility deity of Canaan. The son of EL , the high god of Canaan, Baal was the lord of life, and ruled the death-rebirth cycle. He engaged in a battle with Mot (“death”) and was slain and sent to the underworld. The crops withered, until Baal’s sister, Anath, the maiden goddess of love, found his body and gave it proper burial. The Canaanites worshiped Baal by sacrificing children by burning. According to the Zohar, Baal is equal in rank to the archangel Raphael. According to the LEMEGETON , Baal is a king ruling in the East and governs 66 legions. 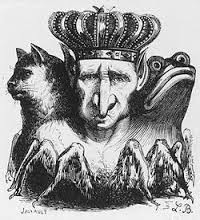 Baal has three heads: a toad, a man, and a cat. He speaks with a hoarse voice. Bael is invoked to impart invisibility and wisdom. Публикувано от Unknown в 11:58 ч.